For organizations who have invested millions building sales automation systems, a new era of sales productivity and performance management has finally arrived. New Sales Performance Management solutions enable sales leaders to align technology to business need and strategy. They provide the capabilities to measure, monitor and report on sales dynamically, in real time and to support accelerated and fact based insight and decision-making. Designed for the sales executive, this series of Sirius Decisions research briefs focuses on the advent of metrics-based sales productivity. 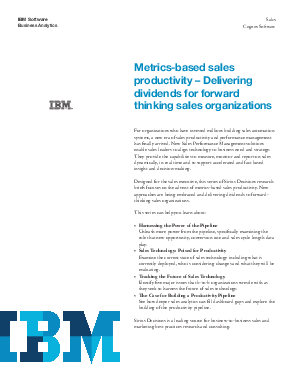 New approaches are being embraced and delivering dividends to forwardthinking sales organizations.